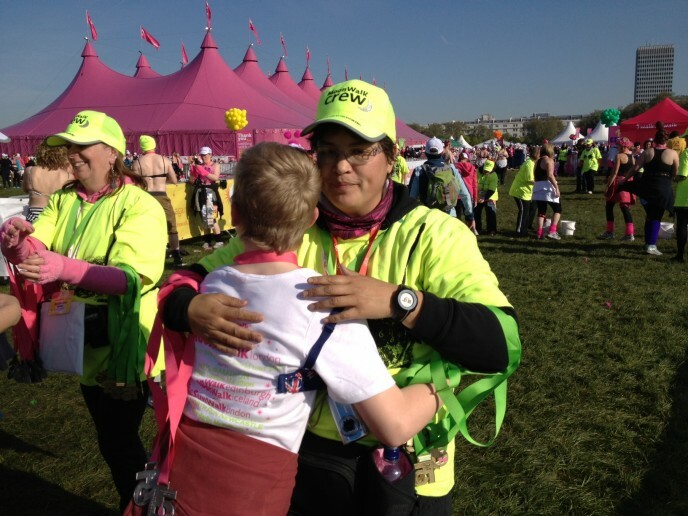 At 8:17am yesterday morning I burst into tears as I crossed the finish line of The Moonwalk, the tears weren’t for me they were for Daniel as he had just completed the walk too! 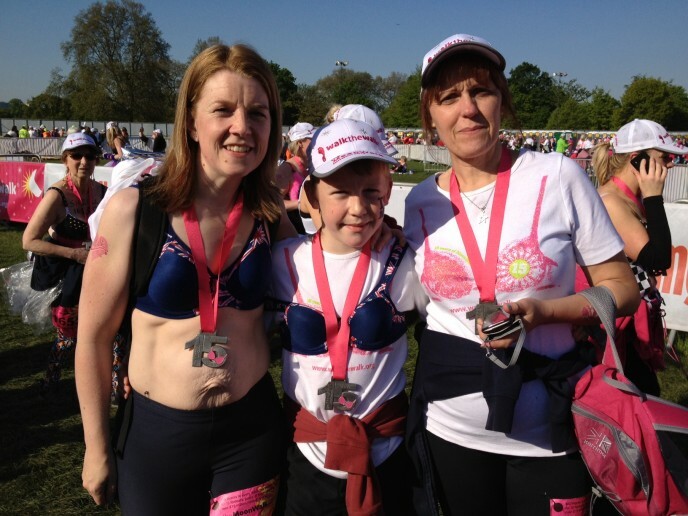 For those readers that don’t know about The Moonwalk it is a walk that takes place in London each year where 17,000 women (& a few men) walk 26.2 miles, a marathon, through the night to raise money for breast cancer charities. We started training in January of this year and since then we have walked over 200 miles; just this training alone took huge commitment from Dan, with some training walks occuring after he had played a rugby match on a Sunday morning. Yesterday evening finally saw the arrival of Dan’s challenge and he was full of confidence that he was going to be crossing the finishing line & collecting his medal on Sunday morning. 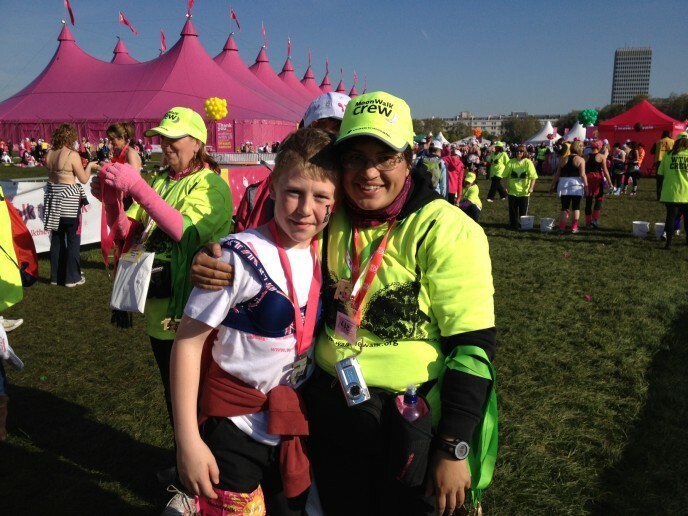 The first 17 miles were a doddle for Dan and between miles 10 & 17 he took off by himself at a speed that neither I or Beverly could keep up with, we only caught up with him as he queued for a toilet break at The Royal Albert Hall. During this last third of the walk we walked past the Breakthrough Breast Cancer buildings where the name of Dan’s Nana is on a plaque – it was special for me to be able to show Dan this & I have to say I had to fight the tears back at this point. From mile 19 onwards Dan started to struggle as his right ankle was starting to hurt, we slowed our pace and fuelled him with enery gel and jelly babies. The poor boy kept asking “are we nearly back at the park yet?” At mile 22 I really thought he was going to give up but thankfully a few fellow walkers saw he was hurting and gave him a huge confidence boost by telling him that he was amazing for doing the walk! We reached the park around 7:30am and Dan got his second wind and he sped up, well sped up as much as you can after walking 24 miles. The last 1.2 miles seemed to go on for ever but with each step I could see the sense of acheivement growing in the face of my child. I hope Nina is proud of him too!